In the final installment of this series, we’re diving into the topic of body fat percentage to help you see why the scale shouldn’t be the sole judgment call on your health. It’s no secret that we are big fans of the scale at Omada. Why? Many reasons. For one, it acts as a huge accountability tool. The folks that use our scale daily go on to lose more weight than those who don’t. It’s a daily reminder that says, “I’m here and I’m doing this!” Daily feedback also helps us understand what’s happening in our bodies and helps us make connections between our food/activity and our weight. Too much sodium? Sore from a workout? Drinking enough water? We can respond quickly and make adjustments. Frequent weigh-ins are also beneficial because it takes time to see true changes in our muscle size and appearance. Consistent strength training, in particular, takes two or more months to have an impact on our muscle size and weight. Seeing our scale’s trajectory move downward each week makes it easier to be patient as we work for those long-term benefits. The scale prevents us from thinking, “I’m not losing weight… it must be muscle because I have been working out!” If we know muscle mass takes time to develop and takes a diligent strength training routine (not just walking, running, going on the elliptical, etc. ), we can’t rely on that excuse when the scale isn’t budging after the first few weeks of exercise. The scale keeps us honest. However, I will admit there are times when the scale isn’t our best tool. Even with all the benefits described above, no ONE tool can provide all the accountability, information, and motivation needed. To truly set yourself up for success, it’s important to know about other tools you can use. In this post, I’ll make a case for why monitoring body fat percentage can be an additional and helpful tool to use. Every so often as a coach, I’ll have a conversation that goes something like this: “Coach, I’m eating right and I’m exercising. I’ve even been sticking to my strength training routine like we discussed! I feel better and slimmer these past few months, but this scale isn’t budging. What gives?” In those moments, assuming their food and activity logs look as consistent as they say (and after plenty of close observation), my next move is often to start a conversation about body fat percentage. 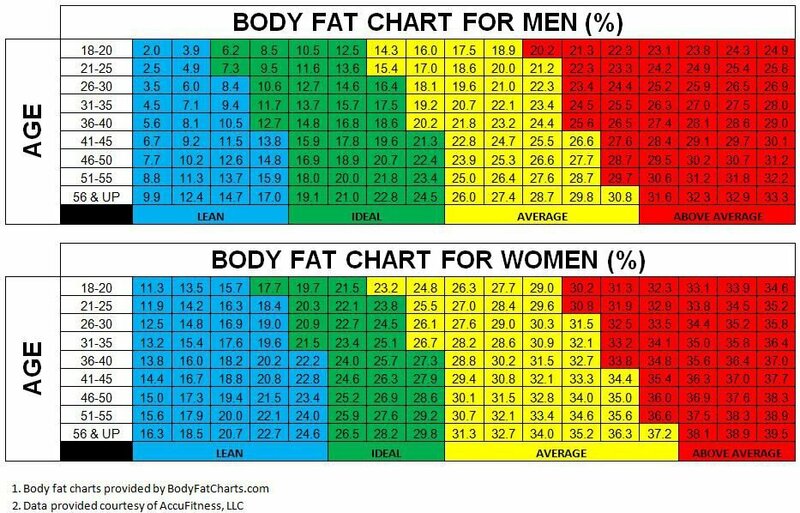 Body fat percentage (BF%) is how much someone’s body is made up of fat mass. This is important to look at because, generally speaking, leaner bodies are healthier ones. Not only is muscle mass healthier for us than fat mass, it also appears differently on our bodies. A pound of muscle weighs the same as a pound of fat, but because muscle is much more dense, it takes much less space in the body than fat. The biggest advantage of BF% testing is that it distinguishes fat mass from everything else, whereas the scale only measures TOTAL mass (fat mass + lean mass). If we’re losing fat in favor of muscle (which begins developing 6-8 weeks into a consistent strength training routine), that scale might show zero results for your effort, because it can’t tell the difference between fat and muscle! In contrast, a BF% test can show you those differences. When it comes to fitness, you might often hear, “Muscle weighs more than fat.” But this statement is not true! Rather, a more accurate statement would read, “All things being equal, a person comprised of muscle will weigh more than a person comprised of fat.” However, that muscular person will also likely look noticeably slimmer than their less muscular counterpart. One pound of muscle simply takes up less space than one pound of fat. 1. Your clothes are fitting differently, you look noticeably slimmer, or feel more firm. 2. You have increased the intensity of your workouts over the past 2 months, specifically strength training. 4. Your BMI is nearing or in the normal ranges (19-24.9), especially if you have a more muscular build. If you find yourself hitting 2 or more of these criteria, it might be a good time to reach out to your health coach for their opinion. There are many ways to assess your body fat percentage. A popular method is to use a Bioelectrical Impedance Analysis (BIA) scale, which sends a small electric current through your body tissues to estimate body fat. There are a number of models available commercially, such as Fitbit’s Aria. Most gyms will also perform a body fat percentage test for a small fee, or you can ask your doctor to do an evaluation for you. It is generally recommended that people start with visual comparisons. BF% varies by individual, but generally speaking, the healthy range for men is 10 to 20% and for women, 15 to 25%. We also develop more body fat as we age. (The older we get, the more fat tends to increase around the organs and within muscles.) The American College of Sports Medicine provides standardized guidelines around BF% and age. You can find your ideal percentage with this chart here. Just remember that a low BF% isn’t everything! Having little fat with no muscle isn’t ideal. We want the best of both worlds: to increase muscle and lose fat. This is why we do not recommend deprivation or starvation diets; losing weight at the expense of our muscle mass is unhealthy! The scale is an incredibly important tool for accountability and motivation, but a truly great approach is one that includes multiple forms of measurement. Weight IS just a number, and the more information we have to assess that number, the better. The scale and/or body fat percentage should be used as one of many ways to understand how you are progressing. As you work to lose weight or improve your body composition, remember that these goals are ultimately there to motivate you towards your ultimate aspiration—improving your overall health and personal well-being. Allison is an Omada Health Coach and Manager, born and raised in the Midwest. She is a former D-1 collegiate athlete who holds a B.S. in Psychology, an M.S. in Kinesiology, and several fitness/sports certifications (NASM, AFAA). She’s finally learning how to cook (and even enjoying it! ), often visits the library for fun, and can’t resist being outside when the weather is warm.